Here are the latest update, what’s new and trending at The Body Shop Malaysia. I am sure many beauty enthusiast are eager to know about their latest cruelty-free skincare range Roots of Strength™, body care and fragrance Japanese Cherry Blossom Strawberry Kiss and also lipcare Lip Juicer. I am amazed with the Roots of Strength™ high-performing new Firming and Shaping Serum. Well, never get any younger but we can look better and fresher everyday. Let’s check out all The Body Shop new products for this season. I am going to start with the Roots of Strength™ firming and shaping skincare range with the influence of ancient traditional Chinese medicine. 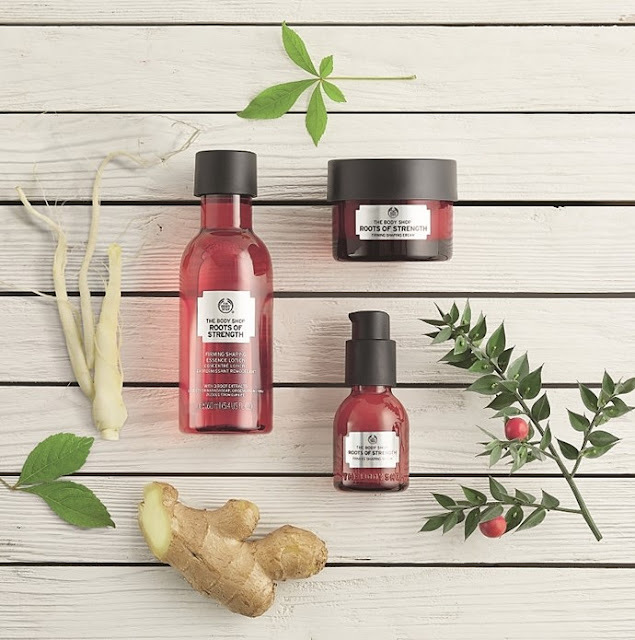 This skincare range is infused with three powerful plant roots to help restore our skin’s strength and shape such as, Ginger Root extract for re-plumping, Ginseng Root extract for firming and Ruscus Root extract for stimulating. This whole skincare range has the scent of ginger and natural herbal. This refreshing, lightweight and fast absorption daily essence lotion is an essential next step after cleansing to help prepare and activate our skin for the beneﬁts of the routine. Combining the lightweight freshness of water with the comfort of a moisturizing gel. This is the key product for this range and it’s made with 99% ingredients of natural origin. The texture is like fluid emulsion, lightweight and silky with ginger and herbal scent. This uplifting serum glides and absorb effortlessly onto skin, I love the Chinese herbal scent. The serum is not oily or sticky, it absorb very fast into skin leaving a soft and smooth finishing on the skin. Overall skin is more moisture, firmer and smoother after 3 weeks of usage. If you are looking for natural anti-aging skincare then serum is perfect for you. Mind you it smells like Chinese herbal medicine to me its bearable and can be soothing as well. Do go to any of The Body Shop store nearest to you to check out. This cream compliments the serum, it is rich but non-greasy it penetrates into the skin very quickly. After application skin is comfortable, moisturize, firmer and denser. Fine lines appear reduced and skin feels strengthened. It’s has a spicy and herbal scent and the formulation helps our skin to appear firmer and plumper. 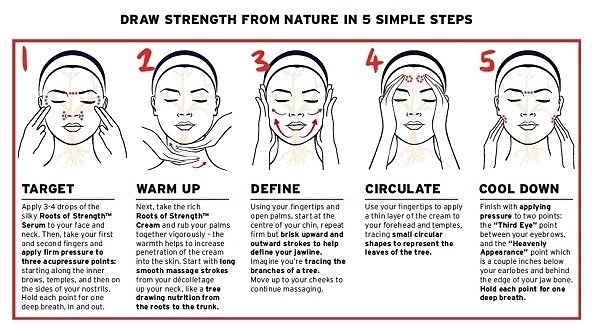 This is the final step of your Roots of Strength™ skincare routine. 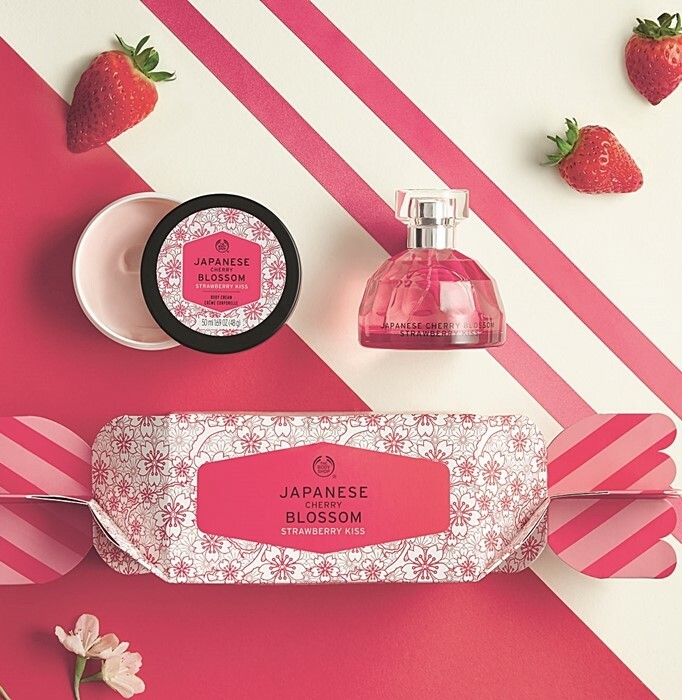 The Body Shop is giving one of their most refreshingly ﬂoral fragrances the Japanese Cherry Blossom an irresistibly fruity twist with new Japanese Cherry Blossom Strawberry Kiss. It is infused with notes of juicy strawberries, Japanese cherry blossom petals and delicately refreshing notes of pink peony flowers with amber. There are 3 skus in this range; Japanese Cherry Blossom Strawberry Kiss EDT 50ml @ RM119; Shower Gel 250ml @ RM55, and Body Cream 250ml @ RM89. By far this the juiciest, most addictive addition to their iconic, cruelty-free collection and its 100% Vegetarian. 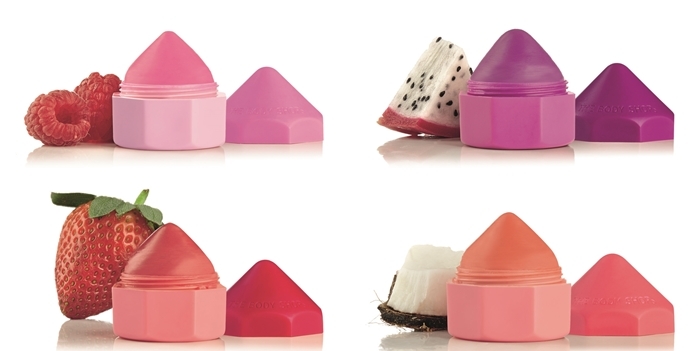 The hottest additions to The Body Shop cruelty-free make-up collection. A pop of colourful to your pout with the new range of deliciously fruity, moisture-rich Lip Juicers. From fruity acai and blueberry to juicy kiwi and kale, these 4 moisture-boosting lip balms are flavoured with irresistible, superfood smoothie-inspired combinations that will leave you licking your lips.